SAL DeTRAGLIA'S VIRTUAL TAPAS BAR: DEEP PURPLE. My parents – who were in Spain for a visit last week – come from a long line of great wine drinkers. This should not, however, be confused with coming from a long line of drinkers of great wine. My paternal grandfather made homemade wine in the basement of his Utica, NY home. This booty was often enjoyed by my father and his teenaged friends during the 1950’s – then dutifully topped-off with tap water for reasons of stealth. In a similar vein, my maternal grandfather attributes his longevity (89 years old and counting!) to a lifetime of moderate jug-wine consumption. That, and managing not to get blown up during World War II. It therefore made perfect sense that, during last weekend, I should take my parents to my now-favorite Spanish wine region: Toro. The city of Toro – and its surrounding areas in which “D.O. Toro” wines are produced – is located in Spain’s west-central province of Zamora (Castilla y Leon); just a grape’s throw from Portugal. The terrain is flat – dare I say, monotonous – with sand-colored soil and a cool climate. The city is dotted with convents, monasteries, arches, palaces and thirteenth century churches. But we didn’t go there for the architecture. We went for the wine. 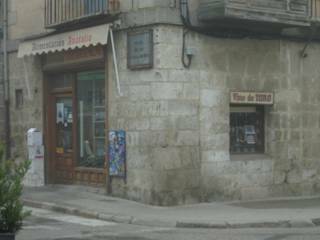 Toro’s wines are made primarily – if not entirely – from Tinta de Toro grapes. They are rich, dense, purplish wines with intense flavor and high alcohol content. They are also ridiculously inexpensive. We bought bottles of fairly good Toro crianza (i.e., moderately aged) wines for approximately 7€ in shops and 12€ in restaurants. Toro’s wines are amongst Spain’s rising stars, and are gathering a following throughout the world. Just yesterday morning, a friend from Denmark informed that he and his crowd often drink Toros to the exclusion of other Spanish wines. Likewise, I’ve read several recent articles in US publications praising the impressive price-quality ratio of these wines. One Washington Post article, in particular, reported that the more well-known and well-established Rioja wine region is feeling the heat from Toro and its muscular brethren. It seems that many connoisseurs of Spanish wine are starting to poo-poo the notion of paying more for a less flavorful Rioja. The article further states that Rioja – in quasi-panic mode – is now gearing-up for production of more Toro-esque wines. This may seem like a logical strategy, but I see a flaw. Even if Rioja’s wineries succeed in boosting the octane of their wines, I doubt they’d be willing to match Toro’s pricing. Or perhaps I’m just biased in favor of the underdog. A-HA!!! If Toro’s wines have a drawback, it’s that they don’t pair well with Dover Sole. Hmm…then again, who the hell wants to eat Dover Sole in a region that specializes in such delicacies as Arroz a la Zamorana (i.e., rice flavored with pig parts that US kitchens typically throw away) and suckling lamb roasted in a wood-burning brick oven?! Perhaps it’s best to leave even-handedness to those wine critics who actually get paid. Back to the trip. Our visit to Toro was enjoyable not only because of its wines, but also because of its wine culture. Most bars we visited served more than a dozen different local wines. And they served them correctly; from bottles extracted from temperature-controlled chillers. Similarly, shops and markets were teeming with botas, barrels, miniature grape presses, cheeses and other wine-related paraphernalia. It was – pardon the pun – intoxicating to be in a place that showed such reverence to my favorite drink. That’s not to imply, however, that my home town of Cabanillas del Campo doesn’t have a wine culture. It’s just that the wine culture here entails choosing between wine decanted from a red Tetrabrik® box versus a green one. Thanks Anders. Now you'd better go shovel your driveway.